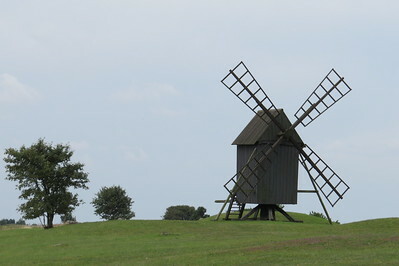 The Agricultural Landscape of Southern Öland is a site that has been in agricultural use since prehistory. One of its main features is the Stora Alvaret, a so-called "limestone pavement", a biological environment based on a limestone plain with thin or no soil. A great assortment of vegetation is found here including numerous rare species. The best known early paleolithic settlement of the area occurs at Alby, where excavations have revealed vestiges of wooden huts around a prehistoric lagoon. Evidence of later ringforts abounds including the most well known site at Eketorp. Later, about 800 to 1000 AD, various Viking settlements appeared on the fringe of the Stora Alvaret. I drove to Öland from Karlskrona, which takes about 1.5 hours. The bridge from the mainland to Öland was fairly busy with tourist traffic, lots of caravans and campervans. The north of the island is said to be a popular holiday destination. I had come for the south of the island of course, as that's where the WH lies. The core zone however comprises about 1/3 of the island, so just after leaving the bridge and turning to the right I started seeing WH signs. I had no clear plan what to see, did not know what to expect of it either. "Looks like Holland" is not why I came all the way down here for a Saturday. But already from the beginning there were lots of cute little windmills by the side of the road. They are much smaller then their Dutch counterparts. 62 have been preserved, though none of them are in use any more. 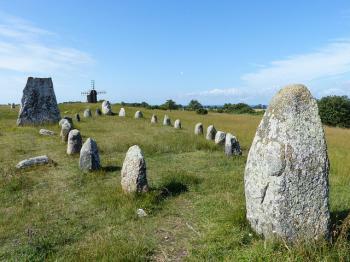 Another iconic sight in Öland are the bronze age and iron age burial sites. Just as the mills, they are conveniently close to the main road southwards down to Ottenby. Every site has a small parking lot and an information panel, most of the time in Swedish, German and English. The most impressive burial site that I visited was the Gettlinge burial ground, which is an example of the "stone ship" burial custom where stone slabs surrounding a grave are laid out in the outline of a ship. After an hour or so (including several short stops) I reached the southernmost town, Ottenby. 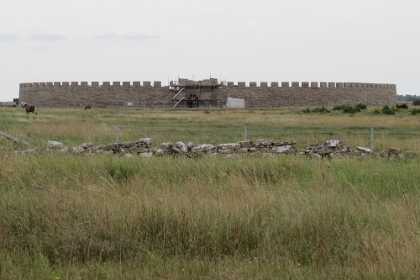 From there I went to the best known sight in Öland, the Eketorp fortress. It has a large car park and even a souvenir shop. Entrance costs a whopping 120 SEK (13 EUR). 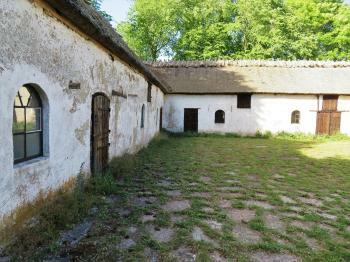 They probably use all that money to pay the actors in the open air museum, which covers the inner area of the fortress. The ring-shape of the fortress is the most interesting part, from afar it looks like an amphitheatre. It's mostly a reconstruction though. I was done with it in 10 minutes. The southern tip of the island is covered by the Ottenby Bird Reserve, which surely is the prettiest area of all. It's a popular stop for migrating birds, and today also for itinerant birders. Dozens of them where scanning the bird crowds via their telescopes or heavy cameras. 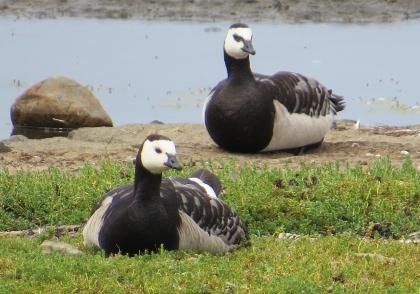 The number of larger birds such as the barnacle goose is certainly impressive. The reserve also holds a large lighthouse and a restaurant where I had my (again expensive) lunch. There are some short walks that start from this area, but unfortunately it had started to rain. So I just drove back northwards again, to the bridge. I made one last stop on the way, at Vickleby alvar. This is one of the zones where the typical Stora Alvaret landscape is preserved. I walked around for a bit on this flat grassland and met some grazing horses. I am a bit puzzled why some other reviewers declare this as one of the most interesting WHS in Sweden. It might be because there's little competition, Sweden cleary lacks any outstanding sites. Having now visited 12 out of 15 Swedish WHS, my vote for best Swedish site would go to Falun. I had one full week in Öland, so I knew I would have ample time to fully explore and comprehend this somewhat elusive WHS. My ancestors are from 2 small villages Northeast of Borholm. Moreover, since this was Midsummer, one of the most important holidays in Sweden, I was fairly busy meeting relatives, celebrating the holiday, visiting grave sites, and exploring the Northern portion of the Island via my cousins car. 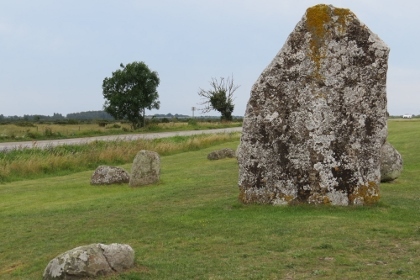 Late June gave me nearly 18 hours of daylight, and at 8am I left Borholm for a truly all-day trip to every key portion of the inscribed area of Southern Öland. This took much research, including reading the vague nomination file, which rarely identifies specific sites and the pictures are hardly visible (captions). Here is a list of key places to help the would be traveller; there are indeed many more, but these are the major sites I visited. This day trip lasted until about 10pm. My fellow travelers did not find the Line Villages as fascinating as me, so I only stopped a handful of times between Kvinneby and Nasby and in which there are numerous line villages (mostly private). I did receive some curious looks as I stepped out the car! The pictures I took were of a well-preserved and authentic line village that exemplifies many of the features outlined in the nomination file. 1) The Stora Alvaret plains to the right and the coastal land/pastures to the left (heading South) 2) The layout abuts the street, and the buildings form a courtyard 3) Cattle-yard in the center, barns form a rectangular perimeter. 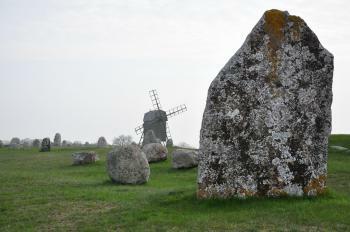 Visiting the listed sites above, the holistic experience better enabled me to understand the OUV of Öland. I would encourage visitors to change their route. Everyone seems to take the Western road South to Ottenby, as did I. However, the Line Villages are on the Eastern coastline, and so is the stunning Gammalsby Coastlands, which has (faint) but viewable traces of ancient settlements (camping is available). Some of the Line Villages have been rebuilt, renovated, yet many authentic village clusters remain. While the vast majority are private and cannot be accessed, one can witness the layout rather well from the exterior. If you begin your trip on the Eastern coastline, you will be rewarded with opportunities to best explore the line villages, visit art galleries (some in old barns), hike coastal lands and/or the Stora Alvaret, and enjoy a small cafe or fica before you reach the Southern tip of Öland. On your return to either Borholm or Kalmar, enjoy the Iron Age burial sites, which you don't have to worry in regards to timing. I visited this WHS in July 2016. I drove here from Vaxjo and after crossing the bridge to the island I stopped on the right to pick up some information brochures and maps. It was really a wise thing to do as the interesting sites are not visible on most GPS navigators and are only marked with a brown sign along the road. However, any resting spot, hotel or windmill might have the same brown sign so without a map you might miss worthwhile stops. Hopefully, now that I've been there I can give some pointers on what in my opinion is worth visiting and the names you should be on the lookout for. I inputted Ottenby Nature Reserve on my GPS and drove along the outermost road with the flat Stora Alvaret on one side (a limestone habitat of several rare and endangered species) and the Baltic Sea on the other. The Stora Alvaret landscape is nowadays an agricultural landscape with several mounds and burial stones here and there. Aesthetically it reminded me a lot of Hvar, Croatia or Terceira in the Azores. Oland is the second largest island in Sweden so expect to drive for an hour or so to get to the southernmost tip but you'll be stopping along the way and walking for quite a bit so plan at least half a day to scratch the surface. I cannot understand why such a site has not been inscribed as a mixed site because it clearly has the potential. All the main cultural sites will be on your right hand side so keep it in mind while driving. For the first minutes you'll seriously think you're in the Netherlands with several wooden mills on a flat landscape. 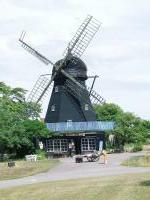 There are 2 types of mills: the tower mill also known as the 'Dutchman' with its top part turning into the wind (like the private Bjorhovda mill), and the post mill which turns completely towards the wind (like the Kvarnkungen windmill which can be visited for free). After that there are several smaller windmills and the quaint Blasas church. The first Bronze age and Iron age remains you'll encounter is the Mysinge burial mound. It is the second largest burial mound on Oland and together with the one at Gynge it forms part of a burial ground which is over 1km in length. Instead of having an entrance, most of the sites can be accessed by climbing wooden steps over the rubble walls which I think is quite an original idea. As I had already spent quite some time to get to Mysinge, I really started to think that if this WHS only had such burial mounds on offer together with a couple of standing stones and windmills it would just be a quick tick-off and really nothing special. However, on one of the information brochures I spotted a picture of the ship-shaped Gettlinge Burial Ground so I kept my eyes peeled for the sign with that name. After a short drive, I spotted the UNESCO WH sign and just opposite I saw the burial ground with 2 large limestone monoliths placed rather like an entrance. The Gettlinge burial ground extends for nearly 2 kms so I parked my car in one of the few spaces along the road (bicycles are the main means of transport here), climbed over the rubble wall used the steps provided and walked the 4km loop. The main highlight was the conspicuous ship-shaped burial (picture) which was only one of the over 200 different burials. Having visited Tanum the day before I could appreciate the context and importance of such a site which was probably in use for 1000 years, considering the different types of weapons and remains found here. Just before arriving at the Ottenby Nature Reserve, I stopped to see the Karl X Gustafs Wall which stretches between the two coasts of Öland. 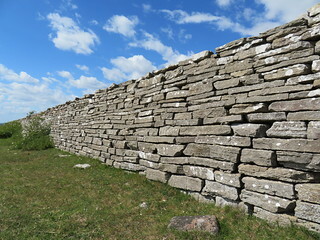 The surreal wall in open landscape is still in good condition and was built in 1653. The intention was to keep the deer in the royal hunting grounds from escaping, although many speculate it served the double purpose of keeping the peasants away from Duke Karl X's sport. Nowadays the road to Ottenby passes right through it but after visiting Ottenby on my way to Eketorp Fortress I manage to spot the other side of the wall. Finally I arrived at the Ottenby Nature Reserve and my eyes immediately feasted on countless amounts of lapwings, plovers, godwits, oystercatchers, geese, ducks, etc. The two-way road gets narrower in the reserve and as a driver you don't only have to pay attention to the never-ending amount of cyclists but also to the occasional black sheep or cattle crossing the road. The coast is what I imagine the High Coast or Kvarken Archipelago to be: an unspoilt coastline with several seals and sea lions basking in the sun, an incredible amount of birds and a salty sea breeze. Right at the tip of the island is the Lange Jan Lighthouse managed by BirdLife employees and open from 25 June to 7 August from 10am till 6pm. The few steps are definitely worth the panoramic view you'll be able to appreciate from up there. With a good camera zoom lens or a pair of binoculars you'll also be able to see the birdlife and sea mammals along the coast. A long hike inland close to the few trees on the Stora Alvaret will give you the opportunity to spot the golden oriole or the bluethroat but you'll need some expensive photo gear if you want a decent picture of them. To my delight, just before leaving Ottenby in the afternoon, hundreds of barnacle geese, mergansers, cormorants and eiders landed just near the car park and I was left speechless. Before heading to Karlskrona, I quickly visited the touristy Eketorp Fortress which is only worth visiting if you have children. All in all, this WHS might not be a top WHS but I think it deserves its place on the list and I'll gladly revisit for the birdwatching alone! When I read guidebook's review on Oland, I was curious with their wordings "haunted beautiful", the words that in my opinion a very strange way to summarize certain place; however, I could not agree more with the wordings they chose after I saw this place. From the historic city of Kalmar, I rented a car and drove to Oland, while most of tourists turned left to the north part of the island for beach and cultural villages; I easily decided to turn right to the opposite direction where the World Heritage Sites located, the agricultural landscape of Southern Oland. At first the flat landscape of farmland was quite Dutch nostalgic with many windmills, large red farmhouses and light forests, then the landscape changed to green hill with stonewall and many impressive standing stone of Viking tombs against the misty sky that made mystery or maybe spooky aura, a landscape that not so Swedish at all! After the strange farmland area, I was at the Stora Alvaret, a large limestone plain; the area looked very dry compared to other area on the island. The stone plain was full with dry savannah-liked grass with some bush and wild flowers, another odd landscape of this island. I continued to finish my trip at Ottenby which was the most southern spot of this island. The area was the desert landscape of peat, hundreds of moss covered rock and Baltic Sea that were merged together into some kind of a weirdly bog wetland that was really disassociated from the rest of the island and maybe the rest of the world. On the way backed to Kalmar, I felt that the beauty of this island started to haunt me with its many curiosities I saw. Southern Oland had its unique charm and mystery, I was not sure that this was the result of some chemistry effect from limestone and sea or not, but the air and the beam of light on the island were indescribable. Anyway Southern Oland really surprised me; although I did not understand or comprehend the value of agricultural landscape which UNESCO used when inscribed this place, but at the end this place was one of my favorite places in Sweden, and a very enchanting World Heritage Site. In my 2 weeks in Sweden, this was the most interesting WH site I have come across. The landscape of the Stora Alvaret is unique and fascinating, like nothing I had ever seen before. 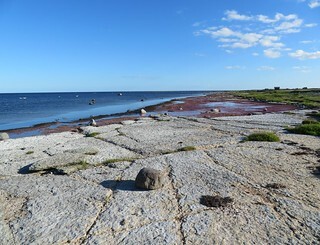 A barren limestone plateau, it covers the southern half of Öland and combines many historic sites with unique natural features (I think it should be a mixed WH site). Driving or cycling is probably the best way to explore Öland, but public transport is also an option. I took the bus from Kalmar (a great city by the way, with a fantastic castle and a nice old town) across the impressive Öland Bridge to the pretty port of Färjestaden. From there I went to Eketorp, an interesting Iron Age fortification that is today a major tourist attraction. Next I went to the Ottenby Nature Reserve on the southern tip of the island, which features a wide range of habitats for migrating birds - and I also climbed Scandinavia's tallest lighthouse there. I thought this was the most interesting place I saw on Öland. Taking the bus is a bit complicated, because even in summer, they don't run very often, but with a bit of planning, it works out fine, and many interesting landscape features can be admired just as easily from the bus. There are several buses that cross the bridge from Kalmar to Oland. I took a #103 bound for Ottenby, and returned on a #105. Along the way I passed several ancient earthworks, stone walls and circles and a number of old windmills while crossing the flat arable landscape. 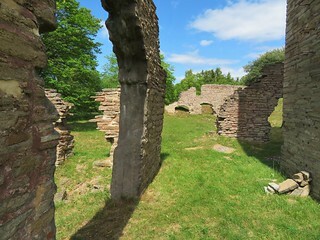 At Eketorp I visited the castle and then the Ottenby Nature Reserve near the lighthouse. I stopped off at Gronhogen for lunch and to inspect a windmill and some walls and earthworks near the harbour, but there was nothing by way of explanation of what they represented. Although the words (I mean the description of the monument) are there, they do not say anything. You should see the immense alvar yourselves - incredibly flat limestone plateau of Southern Oland. I hope, they included also the fairytale Midlandsskogen (Middle Earth Forest) with the misterious Ismantorps borg - strange, abandoned limestone city with seven gates. The city is located in middle of this huge beach and oak forest. Bronze Age: "On Stora alvaret there is a series of large Bronze Age burial cairns"
Neolithic age: "Passage graves on V?stra Landborgen provide evidence for permanent settlement in the Neolithic period." Ongoing Archaeological digs: Sandy Borg (2010 to present) Dept. of Museum Archaeology/Kalmar County Museum, The Linnéaus University and Stockholm University.